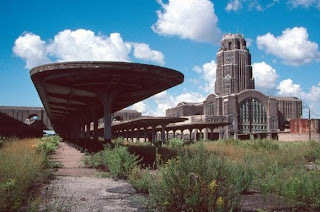 The Buffalo Central terminal has been looted for artifacts, vandalized by bored delinquents, used for art exhibitions, explored by ghost hunters, and even sold for $1. It is a gorgeous old structure plagued by a series of humiliating footnotes, caught in a perpetual fall from grace. But it was not always so. At a time, the Buffalo Central Terminal was an important hub servicing hundreds of trains daily. Still an Art Deco architectural masterpiece, the structure possesses a prominent tower worthy of superlatives, and its halls are said to be haunted by ghostly apparitions waiting for trains that will never arrive. Last Halloween, the TV show Ghost Hunters filmed a 6 hour marathon in the creepy old building. It is possible to tour the structure and even get hitched in its lofty halls. It has been abandoned since 1980.